Go rafting on a half-day adventure down the River Tay in Scotland. 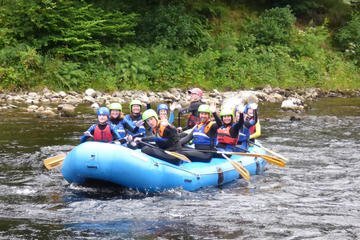 Groups are of various sizes and ages (children aged over 8 years) from Aberfeldy to Grandtully in this perfect introductory river. A thrilling white water rafting experience, groups are accompanied by experienced guides. You can expect adventure, excitement and guaranteed fun! River Tay rafting trips are available mornings and afternoons throughout the year except Mondays and Tuesdays (these are dedicated fishing days). We provide all equipment (wetsuit, lifejacket, helmet, paddle) and transport.